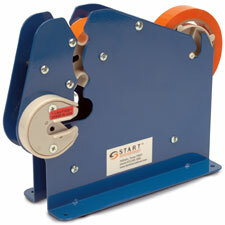 The START International SL7808K Wide-Neck Manual Bag Sealer with Cutter easily places a flag of tape around the bundled end of a bag. The dispenser is designed for larger or thicker bags and automatically measures and cuts tape when the bag is inserted. This unit works well with most thin polyester or reinforced paper tapes. The all-metal construction and pre-drilled holes in the base (for easy workbench mounting) ensure stability during use. Includes integrated bag cutter.